For those who want to keep things simple, we looked at the best basic bidet toilet seats on the market today that do one thing well – wash. These seats don’t have fancy features, and they certainly do not have a pricey tag. They would be perfect for those who are not likely to take advantage of those extra features and for those with a limited budget. We do want to note, however, that when you look for a basic seat that only washes, you’re most likely going to find an non-electric one. That’s because it would make more engineering and business sense to build an electric product with one or two extra features that use electricity! So in this list, you will find some seats that wash only (mostly non-electric), whereas others will wash and have an extra feature like heated seat. The first one we want to look at is an electric seat by Toto – the A100 – which has a heated seat. As a basic seat, it mainly does one thing well – wash. There is no deodorizer or dryer or night light or anything fancy. However, you can adjust the wash settings and the heated seat settings. And there is an energy saver mode. It comes with an attached control panel. If we were to compare the A100 to another product, it would resemble the Toto C100 in appearance. In terms of function, the C100 is like the A100 + deodorizer + dryer. As a basic bidet seat, the Toto Washlet A100 is only available in one color – Cotton White. And you can only get it in elongated form, so it might not fit your round toilet if you have one. This would be the perfect basic seat for someone who wants a bidet with warm water and heated seat, and nothing too fancy. 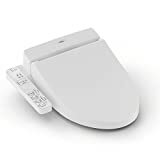 The second seat we want to recommend is the Ellegantz GenieBidet seat. It doesn’t have the brand recognition as Toto, but it is a pretty nice non-electric seat nonetheless. This seat is white, and you can get either an elongated or round version. The nice thing about this bidet seat is that it is easy to clean, unlike most basic bidets. It can snap on and off. In terms of quality, the GenieBidet is surprisingly durable and nicely designed for its price. However, it doesn’t look like a futuristic seat like some of the electric ones. It looks more like your average toilet seat. And since it’s not electric, the GenieBidet will only be able to spray cold water, albeit at a decent pressure which you can adjust. If your only wish is a toilet seat that washes well, or if you just want something to replace using toilet paper, we can definitely recommend this product. 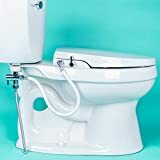 While the Astor is not exactly a bidet seat, we wanted to include it in this list because it turns your existing seat into a pretty awesome bidet seat. Also, because the Astor can be bought at an incredible price, we thought it would appeal to those looking for a basic seat where budget is a major factor. The Astor is actually a bidet spray attachment, which attaches to your seat. You can adjust the water pressure of the Astor Spray using a dial. It is extremely basic. No heated water, no heated seat. Just a water spray. And since it doesn’t replace your seat, but attaches onto your existing toilet, it probably won’t match your décor. So don’t expect it to! The only thing you can expect it to do is clean your bottom! And it does a great job for close to nothing! The Astor is a great product for its price. If you’re just trying out bidets, we would even recommend it as a “starter” product.